Tregosse is a fantastic holiday home with 5 bedrooms spread over 2 floors. They are large, 3 with ensuites, and all with outstanding views across the ocean. The living areas have a great feeling of light and space with high ceilings and bay windows out towards the sea and the wood burner makes it cosy on a cold night. The beach at Trebarwith Strand is beautifully clean, has a surf school in the summer months and is great for rock pools, caves and bucket and spade. You can enjoy a well earned drink at the Port William pub or the Mill House both within walking distance. The coastal path goes right past the door and as walkers will know, it really is the most beautiful place for walking, in particular the walk to Port Isaac from the house. A little further afield (20-30 min drive) there is the Camel Trail and the famous beaches at Polzeath and Rock. Bodmin Moor has yet more stunning scenery and the rest of Cornwall has so much to offer. My husband and I have 2 children aged 7 & 9. We move around a lot because of my husbands job so we bought this house so we could have somewhere to go for holidays. I grew up on a farm in Lincolnshire but have enjoyed many holidays in Cornwall as a child with my cousins. My husband was also a regular visitor to Cornwall as a child hence our draw to this area. This property stood out for us because of its size, proximity to the beach and its incredible views. To be able to walk to the beach eliminates the problems with parking and traffic which can get so bad during the summer months in Cornwall. Having the number of bedrooms enables us to have other family & friends to stay in complete comfort and we look forward to our time there very much. The large living space has a wood burner at one end a games table at the other with plenty of seating for all the guests. The open plan kitchen diner is lovely and light with access to the BBQ area and garden. Well equipped with a 5 hob/3 oven range cooker, fridge/freezer, microwave, dishwasher, toaster and kettle. Outside: The property has a good lawned garden with sheltered area for seating and BBQ NEW Boot / Utility Room: The utility room is now complete and has a shower, washing machine and tumble dryer and plenty of hanging space for wetsuits, coats and general outdoor kit. Cleaning / Towels / Linen / Maid service: Towels and linen are provided and changed at the end of each booking. For longer stays weekly cleaning and change of sheets can be arranged with an additional charge. Please bring your own beach towels. Overall we enjoyed our stay. The house is maintained to a good standard and, even with 10 of us, we did not feel on top of each other. The location gives stunning views across the headland & out to sea. It can be very windy, but the double glazing means the noise & draughts can be kept out. Its well positioned for walks via the coastal path & down to the beach at Trebarwith, however its slightly remote from Tintagel so you probably need to drive to the shops. Kitchen is spacious & well equipped & the table comfortably seats 10 people. The sitting room too copes well with a large group. Bedrooms & bathrooms are fine, although the downstairs loo is a bit odd! The local pub is worth a visit & is only 10 minutes walk. The house was ideal for our 3-generation family party. It was comfortable and had everything you could possibly need for the stay. Loved the sea and sunset views and the space! Quality bathroom and kitchen fittings. The housekeepers were very helpful when our grocery delivery arrived before our scheduled entrance. Loved the walk to Trebarwith Strand where everything you want for beach was there - shop, pub, sand, waves and rocks. I took my family away to celebrate my 60th and had a lovely week. 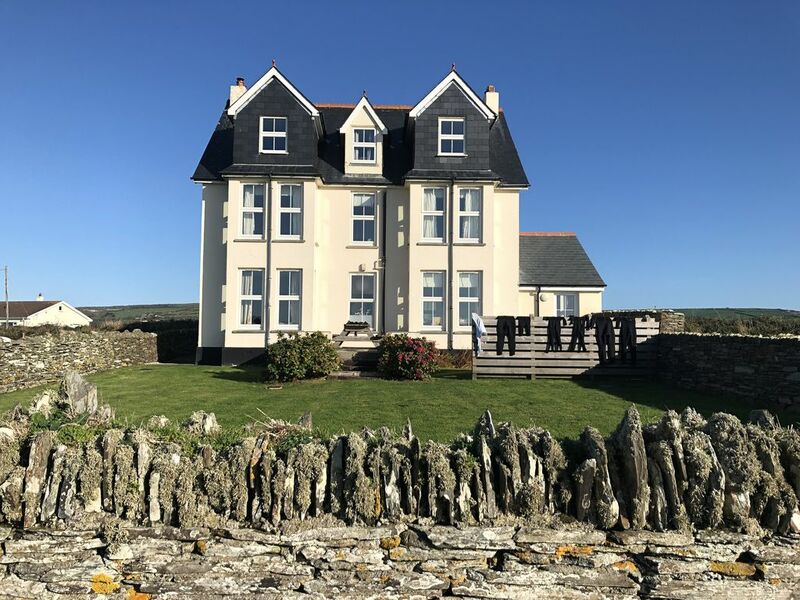 The house is in a stunning location standing alone, perched on the cliff but with beaches and Tintagel withing walking distance and had all the amenities you could need. Would definitely recommend. The property size and facilities, together with its location adjacent to the coast path made it the perfect place to stay. Close-by Trebarwith Strand is a magnificent beach and the house is within easy driving distance of lots of north Cornwall's attractions. Lovely large house with wonderful walks, clean and cosy with beautiful views. We had a wonderful holiday and lovely weather. The house and garden had plenty of room for the children to run around, and it was lovely to walk out of the house across the fields to the beach or along the cliffs. The views were magnificent and the house was warm and clean. We were all very comfortable in the beds and had plenty of fluffy white towels. The games were mainly for very young children but our grandchildren managed to play monopoly with a rather depleted bank! It was good that we had nice weather and could go out a lot. Make sure you check the tide times as there is no beach when the tide is in. 3 generations of our family had a lovely time- plenty of space and with all you could need there. Trebarwith Strand sandy beach is a 10 minute walk. It is a stunning tidal beach with pubs, cafes, shops and surf school (summer only). The beach itself is great for rock pools, mussel picking, caves, sand and surfing. The coastal path is across the field at the front of the house. It is advisable to come by car but here are the nearest transport routes. Tintagel is just 1 mile and has restaurants, a butcher, spa, cash point and plenty of tourist shops. Further afield there are supermarkets in Camelford, Wadebridge and Bodmin, most of which do deliver. There are many great restaurants and pubs in the area with the most reputable probably being in Port Isaac and Rock.